Main characteristics - in a DDA reaction one or more double bonds in a regular Diels-Alder are replaced by an alkyne. The primary cyclic reaction product contains an allene group. To reduce steric strain the cyclic allene will engage in secondary reactions, for instance secondary DA reactions or retro-DA reactions or those forming an arene compound. Depending on the nature of the reactants (alkene, alkyne, enyne diyne) 4 reaction types are identified. Reaction is thermal or photochemical and can be catalyzed by zerovalent palladium. Debute - 1895 Michael & Bucher DOI DOI in a reaction of phenylpropiolic acid with acetic anhydride forming a phenyl substituted naphtalene . Earlier example: 1866 Berthelot in the trimerization of acetylene for which reaction in 1967 a butadiyne intermediate was found. 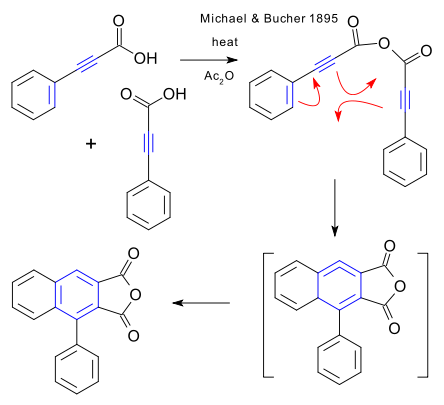 Reaction mechanism - in contrast to DA reactions (concerted) the DDA reactions involve diradicals. Why - synthesise polycyclic aromatic compounds, complex carbon frameworks. No reports on industrial use.